With school back in session, millions of college students will be seeking fall and/or year-long internships to enhance their resumes. As an employer, a major question you have to answer when deciding whether or not to add an intern (or internship program) is: to pay or not to pay? 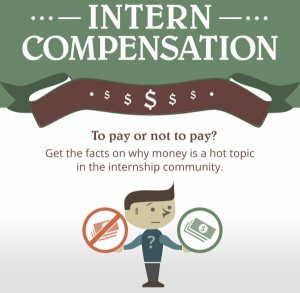 Well, the folks at InternMatch, an online platform connecting the best intern candidates and employers, have created an infographic, “The Employer Guide to Intern Compensation,” that details why money is such a hot topic in the internship world. For starters, did you know that there are approximately 1 million unpaid internships in our nation every year? In fact, 47.8 percent of internships taken by the Class of 2013 were unpaid. So, why should you pay your interns? 1. It could save you from a lawsuit. The infographic details how companies like FoxSearchlight and NBC are facing or have faced lawsuits for failure to compensate interns. 2. It can increase your candidate pool. Paid internship positions get an average of 2.5 more clicks than unpaid positions. They also attract diverse candidates, especially those in debt. 3. It positively affects post-graduation employment rates. The data shows that 61 percent of students who worked at paid internships received at least one job offer. And at $51, 930, the median starting salary for students who had a paid internship is almost $15,000 more than those with an unpaid internship. Paid interns are happier and more engaged as more spend time on professional tasks versus the non-essential and clerical tasks more unpaid interns spend more time completing.